The 41st International Emmy Awards, hosted by John Oliver, was held on November 25th at the New York Hilton. 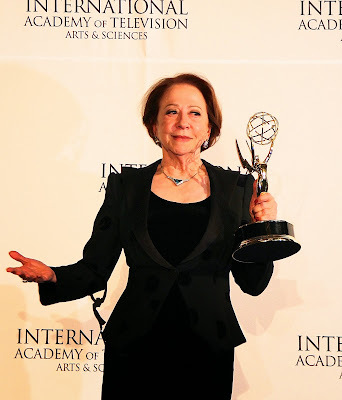 The International Academy of Television Arts & Sciences presented 2 Special Awards and 10 Emmy statues, with winners spanning 6 countries: Austria, Brazil, France, German, South Korea and the United Kingdom. British lead Sean Bean won the Best Performance by an Actor category for his role in Accused. Brazil film and television legend Fernanda Montenegro won the Best Performance by an Actress category for her role in Sweet Mother. Zachary Quinto presented the International Emmy Founders Award to film & television Writer/Director J.J. Abrams. The International Emmy Directorate Award was presented to RTL Group Co-CEO Anke Schäferkordt by world heavyweight boxing champion Wladimir Klitschko. Thank you to the International Academy of Television Arts & Sciences for hosting such a wonderful gala. Congratulations to all the winners! Click here to see coverage from the 40th International Emmy Awards.